We all know how difficult it is to get our pets clean. Getting them still for long enough to give them a bath is normally a test of patience. And once you’re done, thy might emit a funny stench, emanating from their wet coats. Sometimes this stench lingers long after the animals have completely dried up. So, how does one eliminate this wet dog smell? The answer to this is simple, get the right shampoo. The key word here is, right. There are lots of shampoos in the market but very few are right for your animal. That’s why we’ve decided to embark on this journey through the dog shampoo universe. And from our encounters, we’ve identified a few which fit the description of the best dog shampoo for odor. The best ones must not contain any harmful chemical additives. Many do. Still, if you do your research right, you’ll identify the ones with these chemicals and steer clear of them. An example is the shampoos which have artificial perfume added to them. Yes, they smell good but the perfume might end up affecting not just your pet but you. Good ones have at least natural scents in them from natural extracts. The best shampoos are 100% natural. Of course, they cost more but the benefits far outweigh the price. Luckily, we already have a list of five perfect pet shampoos just for you. Read through our reviews of them before making your choice. Let’s get to it. If you’re looking for the best then your search should lead you to OxGord, a fully vegan, organic dog shampoo. It’s a product that’s free of all the harmful chemicals that are found in most shampoos in the market. The OxGord is all natural and organic, meaning it’s not only gentle on your pet but also kind to the environment. At the same time, it offers excellent skin care for your dog. OxGord have delicately balanced essential oils, making this a coat care shampoo that’s recommended by vets. The soapless formula eliminates irritation of eyes meaning that the whole bathing process is made an enjoyable one. The formula helps to relieve your pet’s itchy skin thanks to the combination of aloe, jojoba and coconut oils. These natural extracts are known for their healing qualities not only to animals but also to humans. And thanks to the Oatmeal, Shea Butter, and Natural Rosemary extracts, the shampoo will leave your dog’s coat feeling smooth and moisturized. 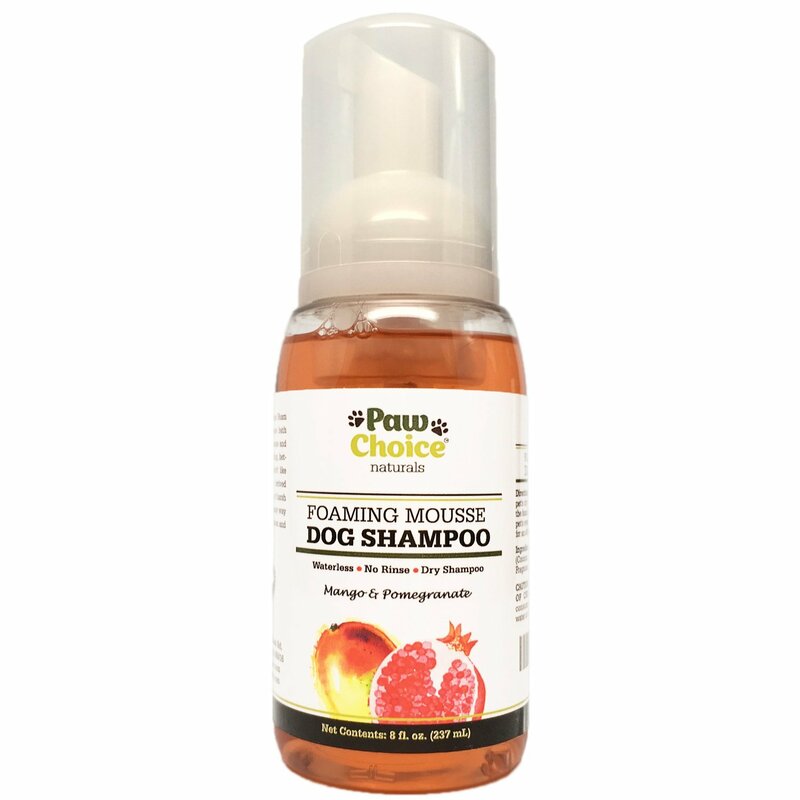 Paw Choice presents to us a dog shampoo that requires no water to use. Because of this, you can use the Paw Choice at anytime and anywhere without the need for prior preparation. Being a natural coconut formula, this shampoo is totally safe to use on your dog. It also works perfectly on sensitive skin. There are no harsh chemicals to cause irritation and is also safe for the environment. Still, it’s tough on bacteria as it totally removes odor from the dog’s coat. And since it requires no rinsing whatsoever, you end up saving a lot of valuable time. With the fresh mango and pomegranate scent, your furry friends end up smelling fresh. All ingredients used are natural, formulated by veterinarians. Still, as an assurance, Paw Choice have a 30 days refund policy. If you buy this shampoo and within 30 days you don’t feel like it’s working for you, they’ll give you a full refund. With such a policy, you’re certain that what they’re offering us is top quality. Wahl is known for their top-notch grooming products. And now, they bring to us this shampoo to ensure our pets remain fresh and clean for longer. It’s packed in a 24-ounce bottle and comes in a variety of scented flavors. You can choose from Eucalyptus- Spearmint scent, Lavender-Chamomile, White Pear, Cornflower-Aloe, Coconut-Lime Verbena or Lemongrass Sage scent. Each one is as aromatic as the other, emitting a beautiful scent that wafts through your entire home. All these options contain natural ingredients derived from the plants themselves with no harsh chemicals used. The Wahl shampoo lathers easily. Only a small amount is required per wash. This ensures that you use one bottle for a long time, therefore, saving you money. So, with this product, you’re able to easily remove odors and kill bacteria and in effect prevent illnesses that may be caused by the bacteria. At the same time, your pet will look and feel good. If you want to go waterless then you might want to give this shampoo from Particular Paws a try. They call it an instant bath in a bottle and that’s exactly what it is. All you do to get your dog clean is spray the shampoo onto the dog’s coat. It then absorbs oil and grease in the dog’s fur, leaving your pet looking and feeling great. So, if you lack the time to give your dog an elaborate bath, using one of these shampoos serves a similar purpose. 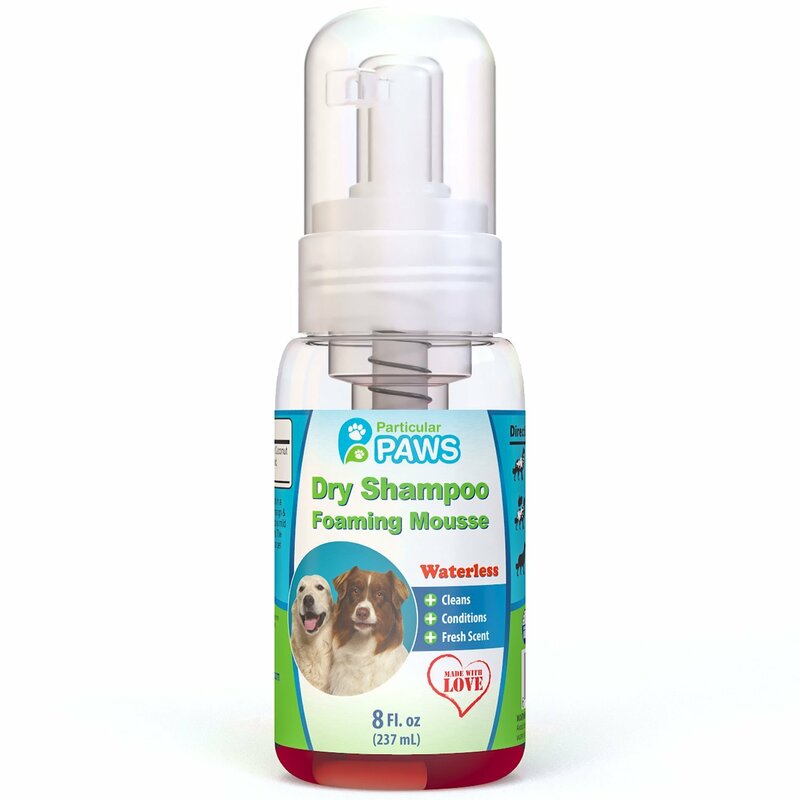 Made with coconut extract, the Particular Paws dry shampoo is kind on your dog yet tough on odor. 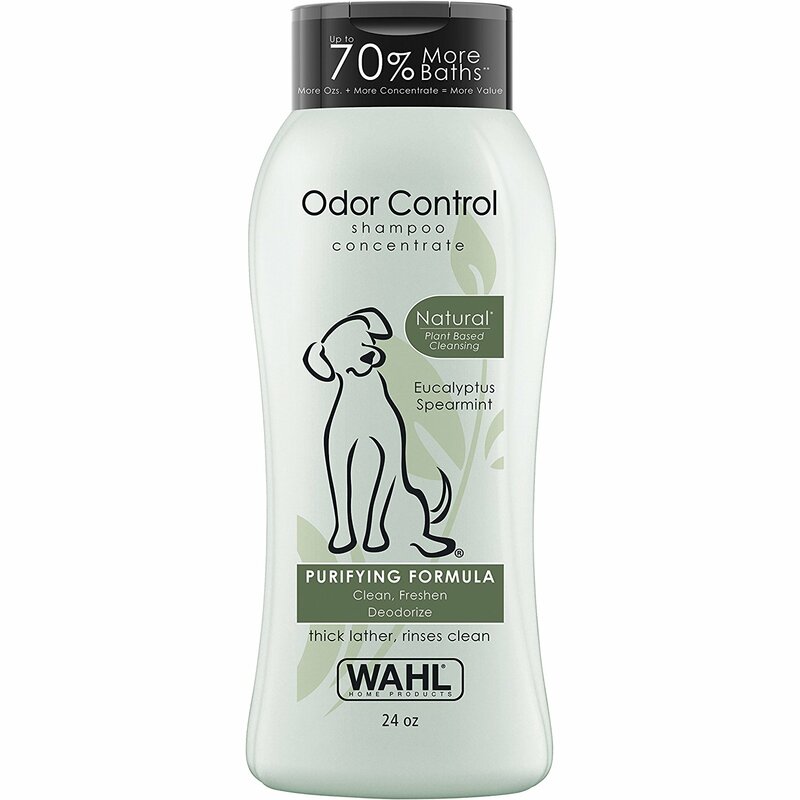 If your dog has sensitive skin then this is the perfect product to use. The spray comes in an 8-ounce bottle. This is quite enough as a few pumps of the shampoo is sufficient for one grooming session. Massage the shampoo into the dog’s fur and allow it to air dry. Because it’s quite easy to use, the Particular Paws is great for when you’re traveling or in between baths. Maple Holistics come in with their take on a pet shampoo. And you can tell from the packaging that they took their time in concocting the perfect odor eliminating shampoo for dogs and cats. 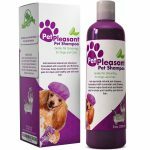 This is a moisturizing pet shampoo that is able to control irritable skin as well as removing bad smells from the pet’s coat. Made of 100% pure and natural lavender it contains antimicrobial properties that work without causing any harm to your pet’s skin. If that wasn’t enough, the shampoo had evening primrose added as well. This is a natural moisturizing agent that leaves the fur looking and feeling soft. Maple Holistic go further to assure us of the quality of this product. They maintain a 100% satisfaction guarantee policy maintaining that if a customer isn’t satisfied with the shampoo, they get a full refund. 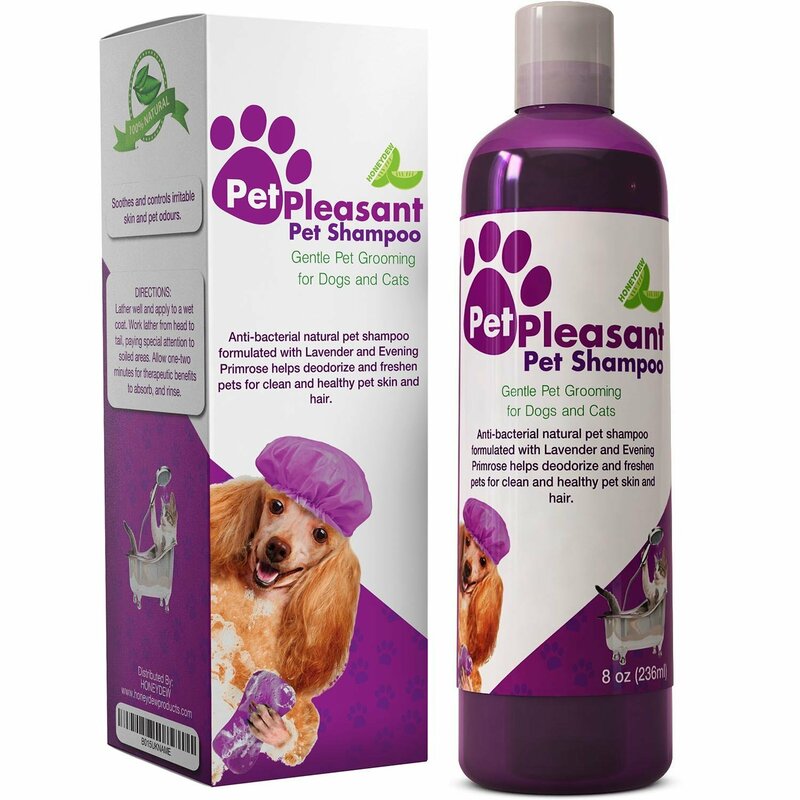 Still, judging from the properties contained in their formula, both you and your pet will love using the Pet Pleasant shampoo. No doubt, there isn’t a shortage of safe pet shampoos available in the market. The five mentioned above emerge as the best. Among these, there still emerges one that is a cut above the rest. It’s the one that contains all natural ingredients without a single artificial additive. It’s the one that leaves your pet with a beautiful aroma and a soft feel. This shampoo is the Oxgord Natural Oatmeal Dog Shampoo and Conditioner. The best part is it contains great features at a cost that’s just marginally higher than the rest.